Singapore Restaurant Week, from 15 to 23 March, is back. Had a lovely experience with Taratata Bistrot last year and decided to find another participating restaurant I have never tried before. 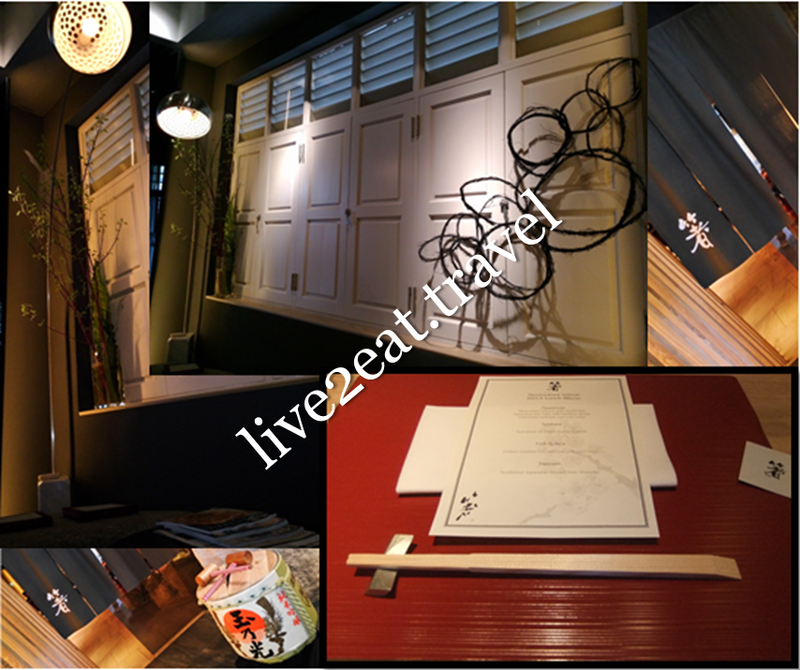 Not too far from the French bistro along Keong Saik Road is Hashi, which I saw after dinner at MooJaa the other day. It is part of the TRE Group that includes Gaia Ristorante & Bar, Oso Ristorante and Restaurant Absinthe among others. And located on the 1st floor of a three-storey shophouse, owned by the group, at Bukit Pasoh Road where Barreto used to be. 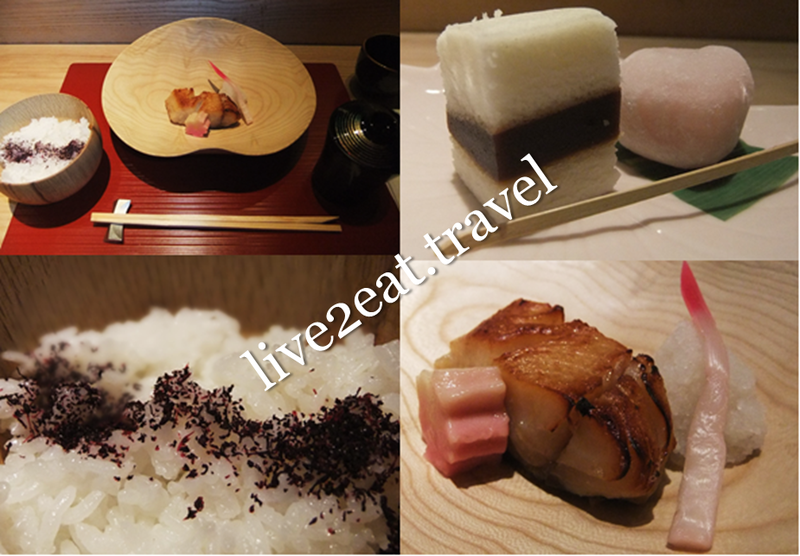 Literally translated in Japanese as "chopsticks", the restaurant is helmed by Chef Tadashi Takahashi who started at Kaiseki Komuro under the tutelage of renowned Kaiseki masterchef Mitsihiro Komuro before moving on to Umu in London and Nobu in Melbourne. Visited on a weekday for lunch and realised that the towering structure of wood at the entrance actually continued into the sake bar. Was led to the 11-seater sushi counter with chairs, by internationally-renowned designer Shin Azumi, which are shaped like a deer and the "horns" doubled as hooks for bags and/or jackets. Solid red pillars stood out in the main dining area, separated from the dining hall at the rear by a stone passageway lined with rolls of bright kimono fabric to represent the different months and seasons. There are also exclusive private rooms in this sleek and contemporary dining space that plays on bold geometrical shapes. Furniture, tableware and cutleries were indeed delicately chosen and arranged. Started with appetiser and thought I heard "green tea tofu" but alas no, it was my favourite Japanese fishcake with bamboo shoot. Sakuraebi kakiage, or a deep-fried cake of fresh baby prawn, was crispy and sweet but a tad salty. Loved the aroma of sesame seeds on top of marinated spinach with shiitake mushroom I could neither rave about nor fault. Not impressed with the cold soba though. 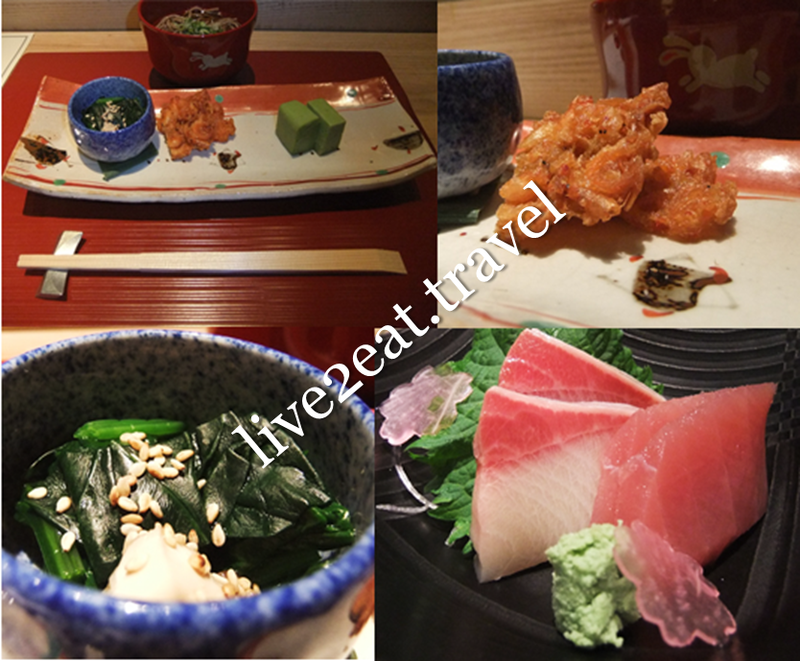 Next on the menu was sashimi – fresh, succulent and thick slices of tuna and yellowtail served with thin slices of pink radish cut to resemble sakura. This was followed by grilled Gindara fish (black cod) with rice and miso soup. The former was served with chewy gluten shaped like sakura, which tasted of flour and reminded me of mochi, and a young ginger bud I enjoyed. Cold grated radish drizzled with cold soya sauce was refreshing between bites of the fish, sweetness well-balanced by the plum and salt atop the rice. Then, it was time for traditional Japanese dessert from Shizuoka. Sake pound cake had a faint aroma and taste of alcohol. Soft and dense, it was perfect with the finely-milled azuki or red bean paste it sandwiched. Sakura mochi with white sesame filling had a nice aroma of both the flower in season now and the sesame seeds. Sweet like how a dessert should be without being overly so. Taste, texture, appearance and colour of the meal were harmonised. No less.